I was surprised to read a freelancer post in a forum about her recommendations in favor of independent buyers over freelancing sites for jobs and projects on the basis of fees. She further stated that a freelancer should be looking for buyers who will send payments outside a freelance site to avoid fees imposed by such sites. My astonishment was due to the fact that it’s my first time to hear a freelancer actually say something like it, whereas, most service providers I've came across with are always hesitant to work outside a freelance site. It turns out that she wasn't the only one though. Researching the web, I've chanced upon other vendors with the same notion on freelancing. As a writer, I started out writing for an agency. It’s a local writing agency where I used to get paid while writing on a part time basis. Being a newbie, I was already contented with receiving less than a dollar for a 500 words article. I don’t have a writing agency but I get to work with prolific writers whenever the opportunity arises. I pay them as much as $2 to $2.5 per 500 words. Based on this comparison, one of the disadvantages of writing for an agency is rate. Most often, agencies pay very minimal rates to their writers such as the unbelievable fee I was receiving in the past. There’s hardly any room for growth, particularly when it comes to payments. Even if there are, it’s very insignificant that you hardly notice the difference. Working under an agency’s umbrella will also deprive you of the benefits of working your way to the top. Your work hours are not logged; you don’t receive feedback for completed work; you don’t earn a reputation even if the number of articles you write increases; you won’t be eligible for additional compensation from buyers; and you can’t possibly raise your rates. Although there are agencies which do offer competitive rates and bonuses, there is still a limit to how much they can pay you. Writing for an agency also doesn’t let you learn as much as you would when you’re an independent contractor. You’re lucky if you find writing agencies which will train you about the basics of writing for the web, writing for various styles (i.e. web content, articles, blogs, press releases, etc. ), and search engine optimization. But chances are, you’ll discover the tricks and techniques even when on solo. Also, not everyone will be willing to share their trade secrets when it comes to writing online. The local writing agency I started out with is nowhere to be found in freelancing sites. They are active in portfolio sites like Skill Pages and classified ads network like Craigslist. I believe that they too follow the same principle as that freelancer I’ve mentioned at the opening of this post. They avoid site fees and find job orders outside freelancing sites too to evade compulsory charges automatically debited in freelance portals. In relation to acquiring projects which do not entail fees, there are both advantages and disadvantages associated with it. Despite the absence of fees so can enjoy the full amount of your hard work, it’s not always beneficial to be working outside freelancing sites. True, you won’t have to pay for fees but question is, do you get paid for your work afterwards? There is no guarantee that the buyer will pay you. Thus, I rarely accept job offers outside freelance sites. There were only a few exceptions. A Pinoy social network site was one because I’ve already worked for the site owner in one or two gigs at Fiverr. A Canada based directory network is another because I’ve had about two projects from the company through Freelancer.com in the past. This company had since then been offering projects and paying through PayPal consistently afterwards. In fact I’ve been working for them for almost a year now outside Freelancer and have sent out almost 30 invoices for projects which are both big and small. With that, we can say that you can only work outside the bounds of a freelancing site once you have established trust for the independent buyer. Otherwise, it would be best to find and maintain work within the protection and assurance of freelance networks. But in case you are really determined to look for independent buyers away from freelancer portals to run away from site fees, it helps to know as much information about a company or person you are transacting with. Ask for their name/company, contact information, and so on. Conduct a little background check and see if you can research information about them online. I did that for a company which contacted me via Skill Pages and they were reputable enough. It was a global social media and SEO company based in the Cebu, Philippines. Similar to writing for an agency, writing for independent buyers (particularly outside freelance sites) won’t help you obtain project feedback. In relation to this, what you can at least do is to add the job in a portfolio and have it updated regularly. Skill Pages and LinkedIn are great sites you can use to enter your work experience details. You can actually simply sync info from LinkedIn to Skill Pages to make it easier for you. I use both of them with Skill Pages synced from LinkedIn, which is the primary. I refer potential clients to my LinkedIn profile for my resume and writing portfolio when applying for jobs in all freelancing sites I am registered for. So with that, the work load you get a hold of would at least be added as a laurel in your hat as long as your enter info about it an online resume site. When using LinkedIn, you can even ask for recommendations from those you have already worked for, provided that they are members of LinkedIn as well. 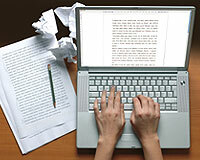 Writing for freelancing sites will be the most advantageous among these three. With these sites, you can slowly build a reputation through feedback provided by clients after completing work. Your total work hours are also computed and add up to your experience in the chosen freelance site. With more hours and good feedback, you can also slowly increase your base rate. The fees are a given, it is a business after all and that’s how the site gains profit. But despite the fees, you are at least secured and guaranteed of payments. But this assurance only applies for billed hours and for projects with escrow or milestone involved. That was something I’ve learned the hard way. See post - Why Build My Rank Ranks Number One IMO). You’ll learn something new while writing online. What you gain knowledge of is not always sweet. You will get your taste of unpleasant experiences too. But that’s all part of the process. What’s most important is improving your writing craft. Some clients share what they know to people they hire but even if you don’t encounter such people, you can still develop your web writing skills on your own. You can study tricks, tips, and technique to become more effective and efficient in your work. So whether you choose writing for an agency, for an independent buyer online, or for freelancing sites, just enjoy writing and love what you do best!